A Year of Being Here: William Stafford: "Today"
"Today" by William Stafford, from My Name Is William Tell: Poems. © Confluence Press, 1992. Art credit: "Frost on Window," photograph by Larisa Koshkina. 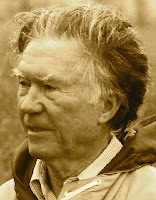 Miss his beautiful mind and heart--thank you for being here William Stafford.